One of my New Year’s resolutions was to spend more time reading and less time watching TV or on the Internet. I’m trying to be off the screens by 9 p.m. so I can then spend that time before I go to sleep reading. So far, it seems to be working. I’ve already read two novels and half a non-fiction book this year, and I think I’m sleeping better, too. One of the novels was something recommended by a blog reader, Roses and Rot by Kat Howard. This book is something of a play on the Tam Lin legend (and is reminiscent of Pamela Dean’s novel, Tam Lin). A couple of sisters, one a dancer, one a writer, get accepted into a prestigious arts fellowship that includes residency in a scenic campus setting, and once they get there, they learn that there’s something else going on — and that there’s an opportunity related to the fellowship that could lead to automatic success for the winner, at a rather high cost. I don’t want to say much more about the plot, lest I spoil it, though if you’re familiar with fairy folklore, you’ll probably have a sense of what might be going on. Aside from the fantasy elements, the book is largely about the relationship between the sisters, who grew up in an abusive home that seemed right out of a wicked stepmother fairy tale. They’ve been estranged, largely due to the interference of their mother, and are hoping that being together in this fellowship will help them repair and restore their relationship, only to find that it might put extra stress on their relationship. The book also delves into the creative process, how it affects your life, how it can be affected by life, and explores what people might be willing to do for success. Some might be eager to pay the high price for guaranteed success, while others would rather take the risk of failure if it means they know any success is purely due to their own merit. The setting is nicely atmospheric, conjuring a place that truly feels magical. Also, I want to know where I can sign up for the fellowship that lets me live in a cottage in the mountains and have all my meals delivered to me while I spend all my time writing. I suspect that fans of my Fairy Tale series will like this one. I also re-read Neverwhere, by Neil Gaiman, which is one of my favorite books. I’d read it several times, but I recently got the reissued “Author’s Preferred Edition,” so I figured it was worth a re-read. I have a story relating to that book that I should probably tell again, as I figure my blog readership has entirely turned over since I last told it, but that’s a subject for another post. In other news, I’m about to revive my every other week writing posts. Is there some aspect of writing, publishing, or the writing life you’d like to have me address? Let me know! And is there something you’d like me to cover in my blog? I kind of feel like I’m writing into the void right now. I don’t get a lot of hits or comments, so I’m evaluating whether continuing with this is a good use of my time or whether it’s something I need to focus on and build. We had our cold weather early in the week, so while the northeast is getting slammed, we’re warming back to our winter normal, which means an hour or so around freezing at night and in the 50s in the afternoon. That’s more my speed. It’s cold enough to bundle up under blankets, but not so cold that I have to worry about pipes freezing or stressing my heater. It’s also good writing weather, though it does get tempting to drift off when I’m sitting on my bed, bundled up under blankets. I’m in the process of revising a book. This is an entirely new thing that I’m writing with the hope of landing a new publisher. It’s a fun idea that I haven’t quite executed to a degree of quality that lives up to the premise, and since I want to use it to not only snag a new publisher, but to make the publisher excited, and maybe have multiple publishers competing to get it so that they’re forced to be excited about it, it’s worth putting in the extra effort to make it just right. The other day, I figured out what to do about one of the problems with this story, but that blew up a big chunk of the book. I spent yesterday trying to figure out how to fix that, thought I’d figured it out, then when I went to write that part, it turns out it didn’t work. I think I was trying to hew too closely to what I’d already written rather than being willing to rewrite instead of just revising. This morning, I think I figured out a fix for that. This feels like such slow going, taking a couple of days to write a single scene. One thing slowing me down is that I’m also working on some other things. I’ve been asked to submit some ideas for a possible project, and so I’m developing ideas right now. Some of them are older ideas I’m dredging up and updating or repurposing, and one is brand-new and being developed. When I have these out of the way, I can devote more concentration to that one book. Working on more than one thing at a time is a new process for me. I tend to be all-or-nothing, but I also find that I fizzle out after a certain amount of work on any one thing in a day. Working on multiple things means I can switch over to something else when I fizzle out on something. Theoretically, that should mean I end up getting more done. We shall see. On Writer Twitter, the topic of Imposter Syndrome comes up frequently. That’s when you feel like whatever success you may have had is merely a fluke, and someone is going to notice it. It’s when you feel like you’re not a “real” writer, for whatever reason — not selling, not selling enough, not being well known, not getting award nominations, not being invited to book festivals. I’ve been surprised by how many people I think of as far ahead of me confessed to feeling this way. The thing is, I’m not sure anyone really gets over this, unless they’ve got a huge ego (that’s not just a front). I would guess that the people who don’t ever feel like they might be exposed as an imposter are those who are the real imposters. Self-doubt does have its uses. It can keep us from feeling complacent and pushes us to keep doing better. When I start to fear that whatever I’ve achieved is a fluke and feel like a nobody, that’s when I buckle down and write more and am hard on myself to make what I write the best it can be. You don’t want to take it so far, though, that you hold yourself back from opportunities out of fear that you won’t be worthy, and you definitely don’t want to take it so far that you give up and quit because you’re sure you’ll never be a “real” writer. The trick to dealing with all of this is to think about your own definitions of success. Don’t look at what success means to other people. What does it look like to you? What really matters? What are you trying to get out of this career? Would you trade what you have for what you see other people having? I had my wake-up call about that when I was at the Nebula Awards conference last year. What often makes me feel like an imposter is the fact that I seem to be a relative unknown in my field, in spite of the years I’ve been publishing, the number of books I’ve had published, the amount of money I’ve made. I was on a panel about dealing with discouragement, and I brought this up as one of my discouragements. I had the audience raise their hands if they’d heard of me, and only a couple of hands went up. But on another panel about finances for freelancers, I was with people I consider far more successful than I am. They’re authors the audience had heard of, people who get award nominations, who have thousands of Twitter followers. And yet they were talking about running through their emergency funds, having to take part-time jobs to supplement their writing income, doing various kinds of crowdfunding. I might be obscure, but I’ve always been fairly financially secure as a full-time writer. I own a home, have no debts other than the mortgage (that I’ll probably pay off soon), and have a big enough financial cushion that I don’t have serious worries as long as I manage my money wisely. That was when I realized that while I’d love to be recognized and acknowledged, I much prefer making decent money. Of course, if I’m already making decent money, then being better known should mean I’d make even more money, but I wouldn’t trade the income for the renown. Meanwhile, it’s entirely possible that the other people on that panel were feeling like imposters because they weren’t living entirely off their writing income without having any financial woes. Or they may be okay with where they are because they’re getting what they want. Back in my day job years, I was at a conference for people in my field (university communications/public information officers), and the speaker suggested keeping a “fuzzy file.” In that job, you get a lot of criticism and are often caught in the middle — the administration always wants more and better results, the faculty just wants to be left alone and not bothered with press inquiries, unless they want more attention but don’t have anything likely to get attention, the press want sources for their stories but don’t want to be pitched things they aren’t interested in. You can’t make everyone happy. So it’s important to hang on to any bit of praise. Keep a file of thank-you notes, press clippings, positive feedback, etc., to look at when you’re feeling battered. Writers should keep their own fuzzy files of good reviews, acceptance letters, good royalty statements, award nominations, screen caps of high Amazon rankings, etc. Write a list of your accomplishments. When Imposter Syndrome kicks in, you can look at your fuzzy file and remind yourself that you deserve what you’ve achieved. Then use that nagging sense of dissatisfaction as motivation to go above and beyond. This year, I’m really trying to treat workdays like workdays. One of the dangers/pleasures of working for myself at home is that I’m totally in charge of my own time. If I want to spend the day reading or watching TV, I can. If I want to take the afternoon off and go to a movie or on a hike, I can. I can spend all day on Facebook or message boards. But then I don’t get any writing done. Even on good writing days, just taking a little break to check e-mail can end up with me blinking out of a fog an hour later. The thing is, I seldom do intentionally take a day off. I consider it a work day, then get sidetracked by other things that aren’t really fun but that aren’t work. So my aim this year is to be intentional about how I use my time. I’m setting timers for activities that tend to have me blinking out of a fog an hour later, and I’m trying to spend as much time on work-related tasks as I would if I had a full-time job. That still gives me more free time than if I were working in an office because I don’t have to commute and I don’t have to deal with all the “office” stuff that isn’t work but that eats time. The last couple of years I had a “real” job, I was telecommuting and working part-time, but I realized I actually got more work done because so much time in the office was wasted. I’ll still allow myself the flexibility to take time to do fun things and enjoy the flexibility I have, but I want it to be on purpose, not time lost in a “I was just checking my e-mail, wow, what time is it now?” haze. Plus, if I really treat weekdays as work days, then weekends will be more meaningful. Yesterday I was pretty good about getting a full day’s work in. I’m putting together some proposals for a potential opportunity, and I had a new idea for one, developed an old idea that’s been looking for a home, and figured out how another old idea might be repurposed to work for this. Then I re-read what I’ve written on a project in progress so I can start moving forward. Meanwhile, I did some promo work. It helps that it was too cold to be up and around much, so I wasn’t distracted by housework or organizing projects. But I also cut off the TV and Internet early and read, finishing my first book of the year. I’ll be losing my cable service as part of my homeowners association fees early this year, and I’m considering scrapping it entirely, just getting an antenna, so I can cut back on my TV watching. I can get plenty of DVDs from my library, and the library also gives access to a few streaming services for TV shows, movies, documentaries, etc. Then I can watch what I plan to watch rather than mindlessly flipping through channels for background noise. Now to go play some more with those new ideas and see if I can develop them into anything. After taking some time off, I’m ready and eager for the new year. Last year I spent more time writing than I had in previous years, but I aim to increase that even more because there are so many books I want to write and I need to get those stories out of my head. Of course, I came up with a new one just as I was falling asleep last night. Because I needed another fictional universe swirling around in my head. 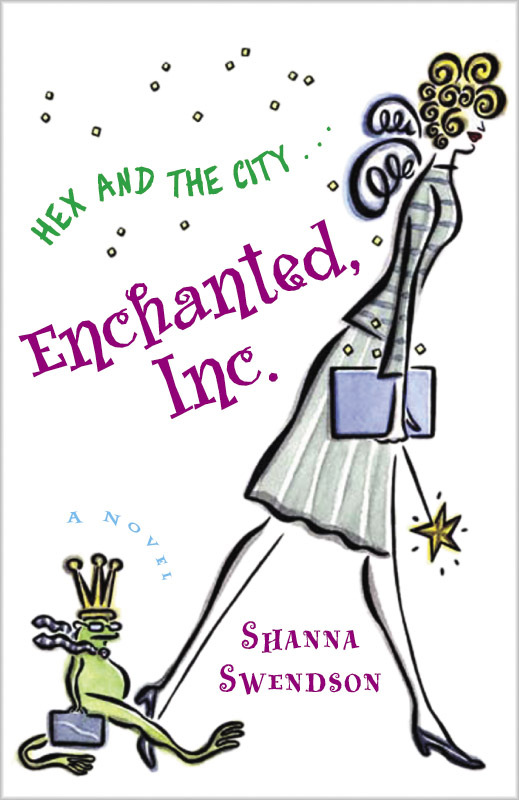 I hope to get another Enchanted, Inc. book and another Rebels book written this year. I also hope to find a new publisher for my young adult fantasy, and I’m working on a book that I hope will get editors eager and excited. Meanwhile, there’s something new I’m trying to delve into, and we’ll see how that goes. In non-writing life stuff, we’re in an odd cold spell here in Texas. It hasn’t been above freezing in more than a day, which is unusual. My house isn’t really designed for weather like this, so I’m getting through it by staying huddled under the electric blanket on my bed. That means it’s a pretty good situation for writing. I splurged last month and bought myself a plush throw that feels really nice wrapped around my shoulders. I like cool weather, but I prefer it to stay above freezing. I may bundle up later today to go check the mail and see if the canal near my house has frozen over. I had to say goodbye to my summer flowers because the pots are just too big to bring them all in for such a long period of time. Really, it was odd to keep zinnias blooming after Christmas, and the morning glory was fading out even without being hit by a freeze. Still, it’s hard to say goodbye to my flowers after I enjoyed them so much. But it will soon be spring again and I can plant some more. I hope everyone had a happy holiday season and is ready to have a wonderful 2018.